Here are two quick drawings. Feel free to chime in with ideas since I have little to no machining experience. It's drawn up as a 1"w x .5" h x 3.5" L then a 1" radius on the top to match the Phantom's OD. I have the threaded hole (to secure the feedblock) going through the part. 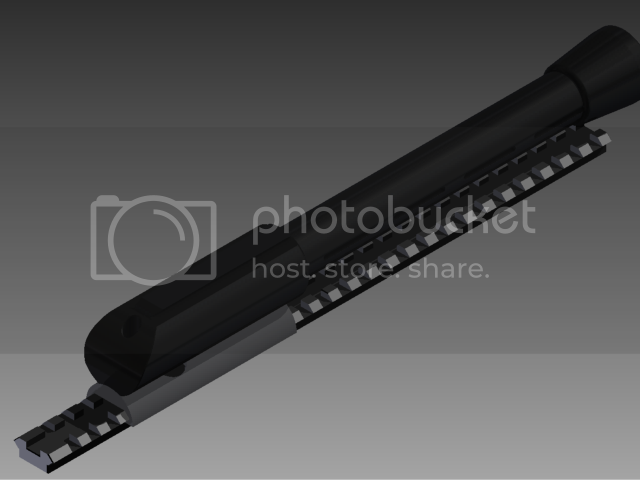 The thought is that the screw would prevent the assembly from shifting back and forth. Shouldn't have too much force on it. Last edited by Skibbo; 01-15-2013 at 11:19 PM. also, maybe it doesn't even have to be that long. would that save cost? This looks sweet, but how far up the rail does it go? 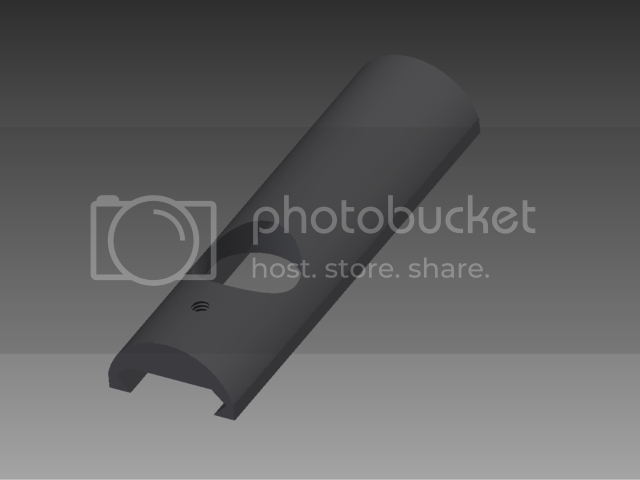 Does it cover the screw to rotate the barrel? When I put the feed tube on mine I had to trim a fair bit off the "nose" of the feed block so I would have room to adjust the barrel screw. Otherwise you would have to remove the feedtube assembly when ever you wanted to switch to mag fed if that is your thing, which it probably is if you bought this marker lol. Velcor is within all of us, you need not go looking for him. He sayeth, "wherever two or more of you are gathered, there shall I be." He is my solid bunker for me to hide behind from the incoming fire of mine enemies, He is the functioning regulator which keepeth my shots consistent, and He is my keen eye guiding my fire towards my hidden enemies. Yea, whosoever shall believeth in Him shall be guided by His right hand towards the flag, and whosoever denieth Him shall reside for all eternity in the Deadbox of Life. This looks sweet, but how far up the rail does it go? 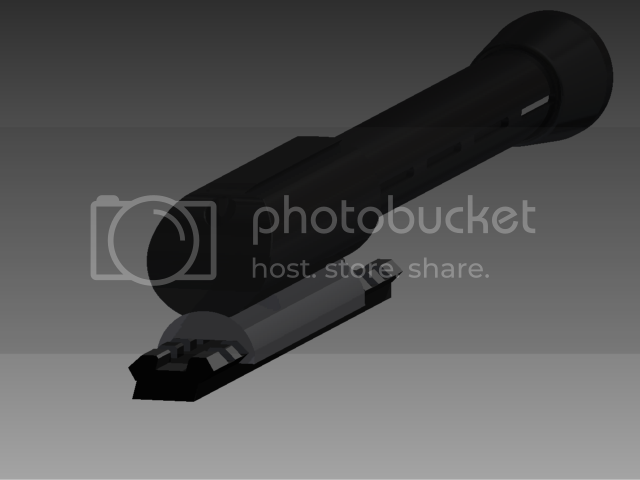 Does it cover the screw to rotate the barrel? It might. I picked 3.5 so it'd be the same length as the feedblock so it looked nicer to me. I'd have to get a measurement of how close the screw hole is to the feedhole. if you had to take the nose off of the feedblock already then both would have to be shortened to fit. Using McMaster's pricing and buying 6' of stock at a time, materials would be $1.50/part +shipping etc. for the 3.5" length. Last edited by Skibbo; 01-15-2013 at 10:54 PM. If it does still work, and even better if it works with the speed wheel, I will be first in line to buy one. Put the flats back on! you dont have any way to hold it all now. Oh, will this leave enough room for the breech screw? not sure. guess it'd depend on how wide the screw head was.